We all know there's history here. Chelsea's position in May 19th's Champions League final has really dropped the gauntlet for Arsenal. If the Gunners don't finish third, they might not be playing in the Champions League next year. The good news is, third place is still in Arsenal's control. Win their last three games and they'll be third (unless Newcastle wins their last four by a million goals, but that's not likely.) It's hard to feel aggrieved that a Chelsea win in Munich could rip the rug out from under Arsenal, because if they find themselves in that situation, then really, it's Arsenal's own fault for not taking care of their own business. If anything, this should give Arsenal even stronger motivation to finish third, and that's not a bad thing. So, congratulations to Chelsea on that performance, and also, thank you for shutting Barcelona up. If that motivation isn't enough, then how about this? Arsenal travels to Staffordshire this week to face Stoke City, a team that has a bit of a recent history with Arsenal. This blog has written at length about their tactics, and Stoke fans have written at length in our comment section about how we're whining, and blah blah blah blah blah. You know all of that already; I don't need to rant about it any further. The fact of the matter is, there is absolutely no reason why this team should not be vehemently gung-ho (is that redundant?) about picking up three points tomorrow at the Britannia. Frankly, I wouldn't accept anything less. MS Paint. Photo: Sports Injury Info. 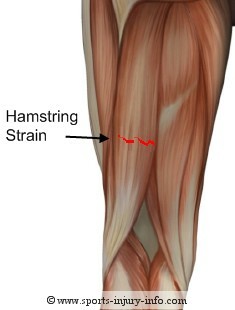 Well, the news on Theo Walcott's hamstring is good news for England (he'll be ready for the Euros) and bad news for Arsenal (he'll be out three weeks.) We're at that stage now where most injuries are season ending, because there's only 270 minutes of football left to be played. Theo gets added to the list of Arsenal players who won't be making an appearance during those 270 minutes, which also includes Mikel Arteta, Per Mertesacker, Jack Wilshere, and Emmanuel Frimpong. Speaking of Frimpong, do you think Wolves would have performed so poorly over the past couple of months if they still had the Ghanaian DENCHfielder? They likely still would have been in the relegation conversation this entire time, but they could not have been as bad as they were down the stretch, right? Theo's injury opens up some question marks up front, though Arsenal will have Yossi Benayoun available again, after missing out against Chelsea due to the terms of his loan deal. Alternatively, Alex Oxlade-Chamberlain could stay in the XI with Gervinho also getting a start. Or, I actually much enjoyed the use of Andre Santos as a winger in front of Kieran Gibbs. The only league match Walcott missed this year was the 1-1 draw with Wolves, which he missed through illness. Benayoun and Gervinho started on the wings. Predicted XI: Szczesny, Sagna, Vermaelen, Koscielny, Gibbs, Song, Ramsey, Rosicky, Gervinho, Oxlade-Chamberlain, van Persie. Jermaine Pennant forgot he owned for five months. Stoke's newest injury blow sees defender Andy Wilkinson facing a scan on his hamstring. Wilkinson had a scan this week and could possibly miss the Potters' final four games of the season. Former Arsenal man who managed to forget he owned a Porsche Jermaine Pennant missed Stoke's 3-0 loss to Newcastle last week with the flu, but is in contention for a return, having returned to training. Tony Pulis has said that Pennant "lacks match sharpness," so Pennant could still plausibly miss out. Stoke's long term injuries include midfielder Salif Diao and forward Mamady Sidibe, both out with knee injuries. I've checked the weather forecast to see how it might affect Rory Delap's rocket arms. The weather calls for periods of clouds and sun with a passing shower. I don't think it will rain during the match, but it's almost 50/50. It'll be low 50's Fahrenheit with winds a little over 10 miles per hour. Stoke slumped to a 3-0 defeat on Tyneside last week. It's rare that Arsenal come into a match having just dropped points in consecutive matches at home. The last time Arsenal dropped points in two straight home games in the league, if spanning two seasons counts, was last May against Aston Villa and August against Liverpool. If spanning two seasons doesn't count in your mind, it was three straight draws in March and April of last season. If you want the two matches to be consecutively played, as Wigan and Chelsea were, you have to go back to draws against Sunderland and Fulham in 2009. As for Stoke, they have held some tough competition at home this year. They got a point from Manchester United, a point from Manchester City, a point from Chelsea, three points from Tottenham Hotspur, three points from Liverpool. That list goes on, of course, as you read farther down the table. Only four teams have won at the Britannia this year: Newcastle, West Brom, Sunderland, and QPR. Three of those teams are in the bottom half of the table. Among those in the top half, they are still yet to host Arsenal and Everton. Stoke are unbeaten in their last four at home; their last home loss was to Sunderland on February 4. Overall, however, Stoke have just one win in their last seven and that was against Wolves. Last week, Stoke were hit for three by an in-form Newcastle side in the North-East. Gervinho had a goal and two assists in the reverse fixture. In their first meeting on November 1, 2008, Robin van Persie was goaded into headbutting Stoke keeper Thomas Sorensen and was sent off. This came with the Gunners already down 2-0 in the 76th. Gael Clichy pulled one back late, but Arsenal lost 2-1. A year later, in January 2010, Arsenal fell in the FA Cup at the Britannia 3-1. A month after that, Arsenal picked up their only win at that stadium, but it came with the price of losing Aaron Ramsey to his horror injury, and required a Fabregas penalty in the 90th to do it. Vermaelen added another late to make that 3-1. Last year, it was another 3-1 loss, though it came during the end of season run when Arsenal had clearly and unfortunately totally stopped trying. Stoke also won the last three league meetings at Victoria Ground against Arsenal before their relegation in the 1980's. Earlier this year, Arsenal won the reverse fixture at the Emirates by a 3-1 scoreline. Robin van Persie was left on the bench to rest and Marouane Chamakh started up front. Gervinho gave Arsenal a 1-0 lead in the 27th minute. Peter Crouch, the giraffe on ice skates himself, scored from close range following, surprise surprise, a set piece in the 33rd. Robin van Persie came off the bench in the 66th minute to rescue three points, picking up a brace in his cameo appearance with goals, both from Gervinho assists, in the 73rd and 82nd minutes. Do not direct your abuse at this man. The referee is not Scottish track cyclist Chris Hoy. It is Merseyside-based Chris Foy. I wish I got to use that joke more this year, after the hilarity of Spurs fans berating the former on Twitter instead of the latter in December, but this is only Foy's second Arsenal match of the year. The one previous was February 1st's 0-0 draw at Bolton. In that match, Foy denied Bolton a penalty shout in the 87th minute. 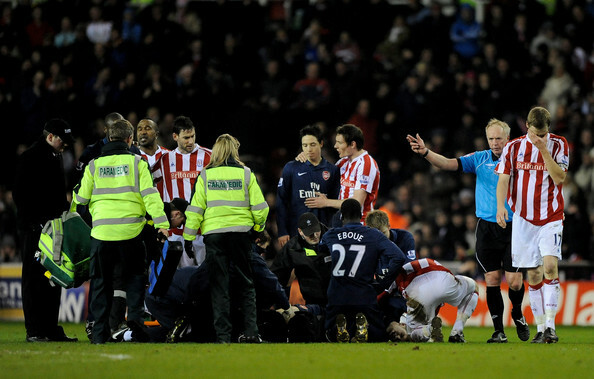 Perhaps it's not a good sign that the officiating performance for which Spurs fans were so angry with Foy was against Stoke at the Britannia. Spurs felt Foy missed two handballs, wrongly disallowed a goal, and harshly awarded Younes Kaboul a second yellow card. Stoke won the match, 2-1. Foy worked one other Stoke game this year, a 2-1 loss at Fulham in February. In the reverse of this round of fixtures earlier this season, Foy was the referee to reduce Chelsea to nine men at Loftus Road. QPR won 1-0 on a 10th minute penalty. Those were two of the four red cards he has shown in Premier League play this year. The third was the aforementioned second yellow to Kaboul, and the fourth was a second yellow to Joe Allen of Swansea. Suddenly, Newcastle is the team to worry about again. There are no early games this week because being played in that time slot are all 12 games in the Championship. It's the final day of the second tier's regular season. Play-off ties will be held with semi-final first legs on Thursday and Friday, the 3rd and 4th of May and second legs on Monday and Tuesday, the 7th and 8th. The final at Wembley is Saturday, May 19. As it stands, Reading has secured promotion, Southampton promotes with a win, and all three teams relegated from the Premier League last year are in playoff positions, plus Cardiff in sixth. That leaves six matches to take place in the standard 3:00 p.m. in England / 10:00 a.m. on the East Coast time slot, including Stoke v. Arsenal. Of most interest to Arsenal will be Newcastle United, who are on the road against Wigan Athletic. The Gunners' other European placement rivals all play on Sunday. The other four matches in this time slot are: Everton v. Fulham at Goodison Park, Sunderland v. Bolton at the Stadium of Light, Swansea v. relegated Wolves in Wales, and West Brom v. Aston Villa in a West Midlands derby at the Hawthorns. Saturday's late game sees Norwich City host Liverpool at Carrow Road, which is, of course, a mid-table battle. As mentioned above, Sunday's games will bear great importance to Arsenal, as their London rivals take the pitch. The early match sees Chelsea host QPR in a West London derby at Stamford Bridge. The late game sees Tottenham host Blackburn at the Lane. Monday will clear up the title challenge picture. Manchester City, three points behind with three games to play, host Manchester United at Eastlands. A City win and the two are all square with two games left. A United win and they're six points clear. A draw and it's still a three point gap. Huge match. These are the reverse fixtures of those played the weekend of October 22-23. In addition, games in hand for teams that were playing in the FA Cup semi-finals take place this midweek: Liverpool v. Fulham and Stoke City v. Everton on Tuesday, Chelsea v. Newcastle and Bolton v. Tottenham on Wednesday.